When talking on the phone, it is very common to have less filtering of our emotions and emotional displays (e.g., a loss of inhibition), thus significantly more (unconscious) nonverbal tells may be seen. Ergo when observing for baseline body language, when possible - it's particularly valuable to observe others for their phone behavior. It's a short cut into their psyche. In this image, French President Nicolas Sarkozy is exhibiting a classic fear display - an emotion rarely displayed in public by a head of state. His eyelids are opened significantly wider than normal ("eyes white and wide") along with an elevation of his eyebrows (asymmetrically here, more on the right - indicating the additional nonverbal tell of skepticism) and forehead contraction/elevation. His lower teeth are on display with the corners of his mouth pulled back (laterally) towards his ears. 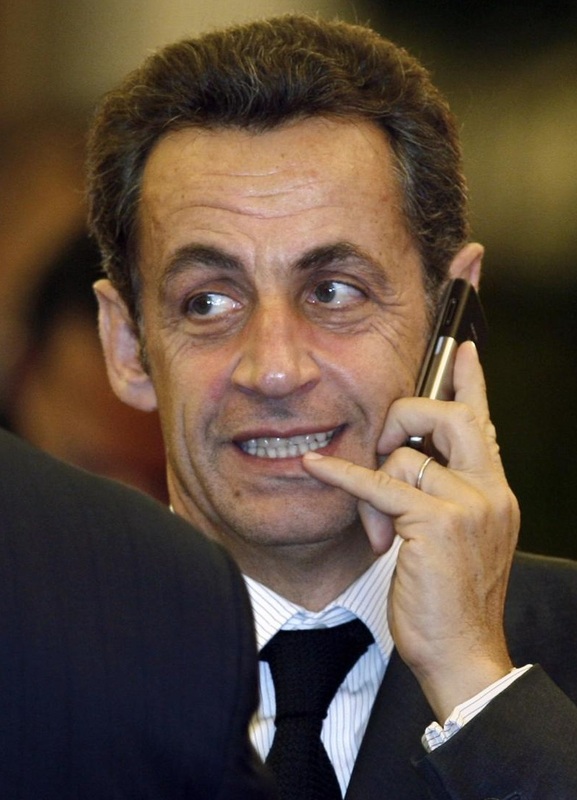 The underside of his jaw is tensed, giving a "double chin" appearance - this occurs because of the contraction of the platysma muscle which often additionally "tents up" the front of the neck & throat (although this is not exampled well in Mr. Sarkozy, see Negotiation Secret # 329: The Neck of Fear).